JOAN COLLINS, ROBERT WAGNER, CYNDI LAUPER AND DEBI MAZAR TO GUEST ON TV LAND’S "HAPPILY DIVORCED"
This season, Peter gets a job working as an assistant for Joan Collins (who plays a fictional version of herself). Peter is thrilled to be working for an icon – until he realizes that two demanding women in his life is two too many. Additionally, Robert Wagner appears as Elliot’s (Moffett) handsome father, and Marilyn (Taylor), the longtime frenemy of Fran’s mother Dori (Rita Moreno, “OZ”), will return – daughter (Cyndi Lauper) in tow. Debi Mazar plays a potential new roommate for one of the Lovetts. In the season premiere, Ralph Macchio will return as Frankie, the New York born-and-bred pizza shop owner who has been romancing Fran. “Happily Divorced” also stars acclaimed actors Tichina Arnold (“Everybody Hates Chris”) as Fran’s best friend Judi, Rita Moreno (“OZ”) and Robert Walden (“All The President’s Men”) as Fran’s parents Dori and Glen and Valente Rodriguez (“George Lopez”) as Cesar, her flower shop employee. TV Land Honors Andy Griffith This Weekend! TV Land for the first time since the launch of the network 16 years ago is unveiling a reimagined logo, redesigned on-air packaging and graphics. The retro-style logo with the classic TV screen has been replaced with a logo that acknowledges the network’s roots but reflects that the network is also programming original series. At the same time, TV Land is launching a second night of original sitcoms, with the Wednesday night lineup starting June 20. The new series “The Soul Man,” starring Cedric “The Entertainer” and Niecy Nash, will premiere, followed by the second season premiere of “The Exes.” On June 26, “Retired at 35” will return for a second season. Betty White received top acting honors at the 18th Annual Screen Actors Guild Awards® last night at The Los Angeles Shrine Exposition Center, winning Outstanding Performance by a Female Actor in a Comedy Series for her role as Elka in the TV Land original sitcom, “Hot in Cleveland.” This is White’s second win for her role on the series as she won the SAG Award® in the same category last year. “Hot in Cleveland” is the network’s critically-acclaimed hit starring beloved actresses Valerie Bertinelli (“One Day at a Time”), Jane Leeves (“Frasier”), Wendie Malick (“Just Shoot Me”) and Emmy® Award-winner, Betty White (“The Golden Girls”). The show is currently in its third season and airs Wednesdays at 10pm ET/PT on TV Land. Bolstered by the success of hit original series “Hot in Cleveland” and “Retired at 35” as well as the modern classic acquisition “Everybody Loves Raymond,” TV Land scored its highest rated quarter in primetime since First Quarter 2006 among its target audience of Adults 25-54, according to The Nielsen Company. 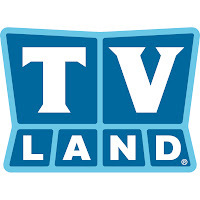 TV Land posted double-digit increases in rating and delivery in prime among its target Adults 25-54 demo as well as Women 25-54, Adults 40-54 and total viewers. For the quarter in primetime, TV Land posted a 0.4/401,000 among its target demo of Adults 25-54, up +27% in rating and +26% in delivery over YAGO. Among Women 25-54, TV Land scored a 0.4/228,000, with double-digit gains of +34% in rating and +33% in delivery over last year. The network attracted 943,000 total viewers in prime, up +35% over 1Q2010 in prime. 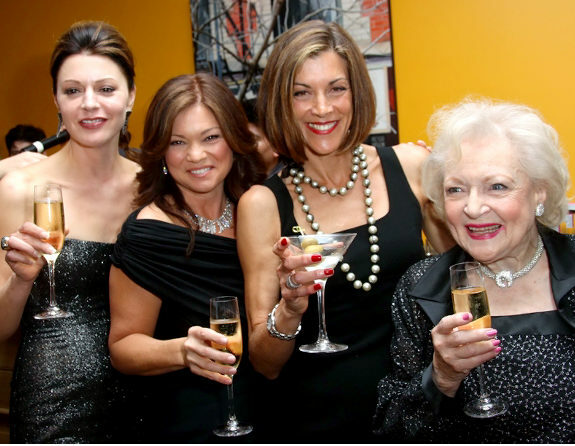 TV Land‘s very first original sitcom “Hot in Cleveland,” received two nominations for the upcoming 17th annual Screen Actors Guild Awards®, it was announced today from the Pacific Design Center in Los Angeles. “Hot in Cleveland” is the network’s critically-acclaimed hit and cable’s #1 sitcom starring beloved actresses Valerie Bertinelli (“One Day at a Time”), Jane Leeves (“Frasier”), Wendie Malick (“Just Shoot Me”) and recent Emmy® Award-winner, Betty White (“The Golden Girls”). The sitcom is nominated this year in two categories including: Outstanding Performance by an Ensemble in a Comedy Series and Outstanding Performance by a Female Actor in a Comedy Series – Betty White. “Hot in Cleveland” revolves around three fabulous best friends from LA – novelist Melanie Moretti (Valerie Bertinelli), eye-brow archer to the stars Joy Scroggs (Jane Leeves) and former soap star Victoria Chase (Wendie Malick) – who find their lives changed forever when their plane, headed for Paris, makes an unexpected landing. When the friends discover that life is better for them and that they are hot in Cleveland, they decide to stay. Starting over together, they rent a house that happens to come with a very opinionated caretaker (Betty White). 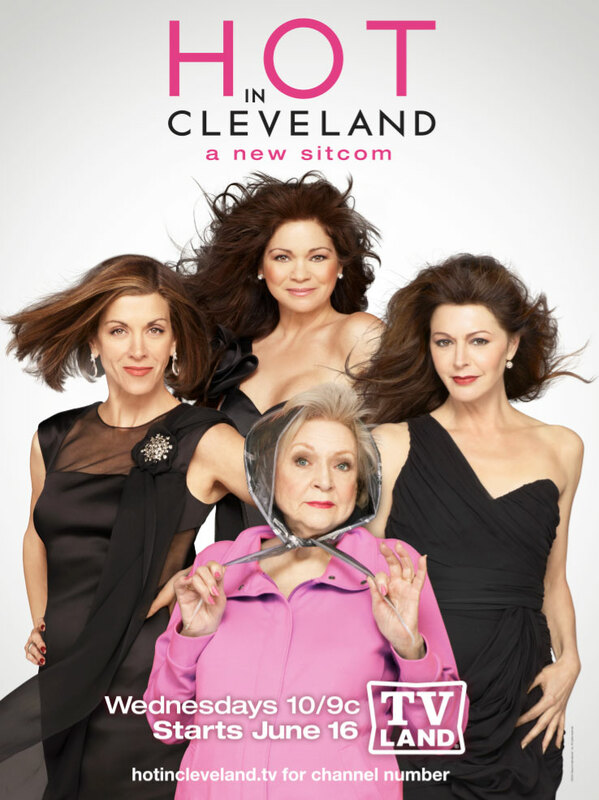 Filmed in front of a live studio audience, “Hot in Cleveland” is executive produced by Emmy® Award-winner Sean Hayes andTodd Milliner of Hazy Mills Productions and is helmed by Emmy® Award-winning Suzanne Martin (“Frasier,” “Ellen”) serving as executive producer, show runner and writer. Lynda Obst also serves as executive producer. The 17th Annual Screen Actors Guild Awards will be simulcast live coast to-coast on TNT and TBS on Sunday, Jan. 30, 2011, at8 p.m. (ET), 7 p.m. (CT), 6 p.m. (MT) and 5 p.m. (PT) from the Shrine Exposition Center in Los Angeles. 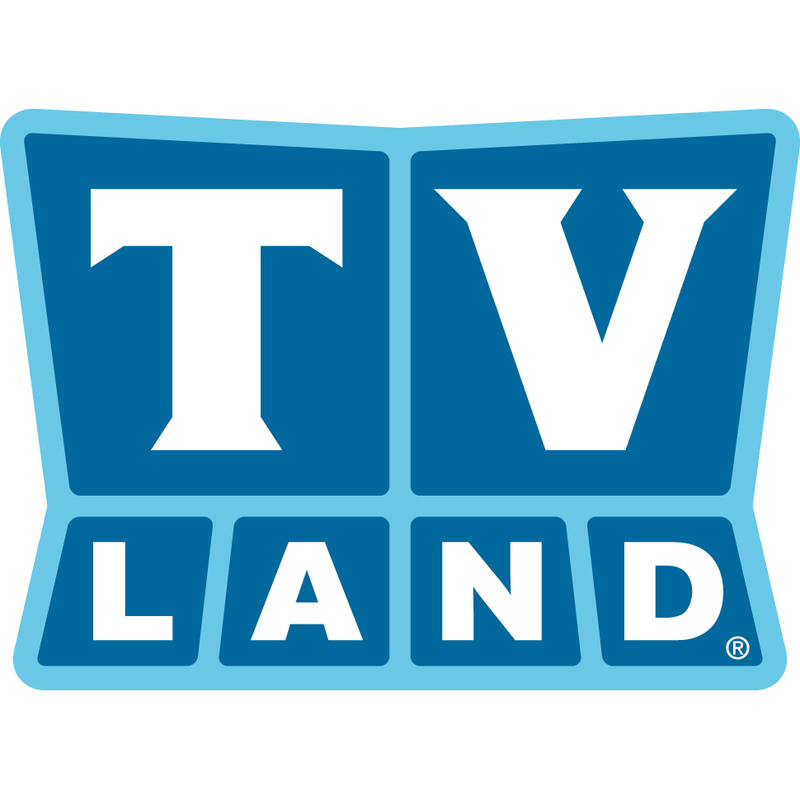 TV Land welcomes back one of the most beloved TV characters of all time when “I Dream of Jeannie” returns to the network with a weekend marathon on Saturday October 23rd from 9AM- 9PM ET/PT and Sunday October 24th from 9AM – 8PM ET/PT. The marathon features unforgettable episodes such as when Jeannie (Barbara Eden) and astronaut Captain Tony Nelson (Larry Hagman) first meet, when Jeannie remembers she is invisible in photos and scrambles to find a solution for this on her wedding day and when she tries to help Tony prepare for a celebration for Captain Peterson and duplicates a special guest – Sammy Davis Jr. Throughout the course of the series, Jeannie’s powers, hilarious blunders and outlandish schemes were so endearing that they eventually turned this duo from genie and master into husband and wife. “I Dream of Jeannie” will air in its regularly scheduled timeslot of Monday-Friday 10AM -11AM ET/PT and Saturday and Sunday 12PM-2PM ET/PT. Inspired by the successful classic sitcom “Bewitched,” “I Dream of Jeannie” aired from 1965-1970 on NBC and made actors Barbara Eden, Larry Hagman and Bill Daily household names. The series begins when astronaut Tony Nelson’s (Hagman) space mission is aborted and he parachutes onto a deserted island. While waiting to be rescued, he notices a strange-looking bottle that has washed ashore. When he opens it, in a puff of smoke out pops a genie named Jeannie (Eden) who gets him back to civilization safely, goes along for the ride and the two return to his home in Florida. Delighted to revel in her freedom and her handsome “master,” Jeannie becomes Tony’s constant companion. Though she capably and willingly grants her master every wish with the blink of an eye and a nod of the head, she causes more than her fair share of trouble because she pops up in all the wrong places and at all the wrong times. The base psychiatrist, Dr. Alfred Bellows (Hayden Rorke) is convinced that Tony is suffering from delusions. Only his best friend, girl-crazy fellow astronaut Roger Healy (Bill Daily) realizes that Jeannie really exists and has magical powers. In the final seasons, Tony finally realizes he loves Jeannie and decides to marry her. TV Land announced today the second season pick-up of its hit original scripted sitcom, “Hot in Cleveland.” The network will start production of 20 new episodes in October 2010 with a launch tentatively scheduled for January 2011. Valerie Bertinelli, Jane Leeves, Wendie Malick and Betty White will return as series regulars for all 20 episodes. “Hot in Cleveland” airs on Wednesday nights at 10:00 p.m. (ET/PT) and is the network’s first foray into original scripted programming. The show debuted June 16 to critical acclaim and record-breaking ratings. The series premiere was the highest-rated and most-watched show in all of cable that day among Adults 18-49, Adults 25-54, Women 18-49, Women 25-54 and Total Viewers according to The Nielsen Company. To date, the series is averaging a 2.1 rating among Adults 25-54, a 2.7 among Women 25-54, a 1.7 among Adults 18-49 and a 2.1 among Women 18-49. The show is delivering 4.7 million total viewers.